The annual Terroir festival is a wine lover’s paradise, with over 20 participating wineries. This year you’ll not only be able to try the wines, but also purchase VQA wines on the spot. Browse through the on-site farmers’ market and see how the wines pair with different foods from over 20 food & farm vendors. This cherry-plum red hails from a dry, sunny vintage with heady fragrances of black berry, dark plum, oak spice, leather and bitter chocolate infused with cherry. Deliciously soft tannins provide underlying roundness to the vivid ﬂavours of black fruit. Gamay zing! With the largest planting of Cabernet Franc in Prince Edward County, Casa Dea excels with this medium-bodied wine that’s soft and smooth at first, with smoky notes of green & black pepper, plum and cherry. A great match for beef & steak on the BBQ. Keint-He’s Pinot Noir is evolving rapidly and the 2012 Voyageur Pinot Noir reflects that. It has a nice blend of primary fruit and oak derived aromas. Typical Pinot Noir sour cherry, raspberry and strawberry fruit are well complimented by cola, dark chocolate and spice. The palate shows cherry, earth and cocoa powder, with a medium body and a blanket of fine tannin. Tip: Try different vintages from the same producer to see how they compare. They can vary quite a bit from year to year. The 2011 Portage Pinot Noir is made from a blend of grapes from three of Keint-He’s estate vineyards – Closson, Benway and Foxtail. Each portion aged separately in French oak for 12 months before the final blend was decided upon. The result is outstanding with notes of fresh berries and dried fruits along with rhubarb, mushroom and hints of molasses and brown sugar in the background. Planting of Northfield Vineyard began in 2003 with 4000 Chardonnay, 5000 Cabernet Franc, and 4000 Pinot Gris. They were intending to plant Gamay in this vineyard at the same time; however, in transit from Europe the vines apparently fell off the boat and were lost at sea! The replacement Gamay arrived the next year and the Northfield vineyard was complete. This Cabernet Franc produced from the Northfield vineyard has blackberry and cherry scents on the nose along with some floral notes. On the palate, you’ll find juicy blackberries, cranberries and sour cherries with a stony minerality that adds an extra dimension to the wine. 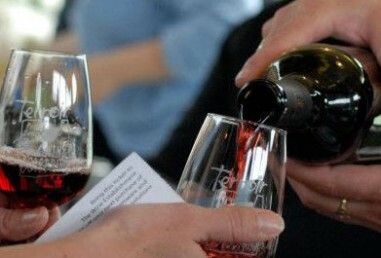 The Terroir Wine & Farmers’ Market is on May 3 at the Crystal Palace in Picton. For more info, visit countyterroir.com.